The pastel colours in this month’s kit are gorgeous, and as always with the Lollipop Box Club kits, the pieces compliment each other beautifully. This month I made this dashboard. I added a die cut bow to the top so I can find the section easily. You could also cut slits at holes to make it easy to come in and out and use it as a page marker. I have placed it on my notes section of my planner. My note section is more permanent notes to myself. I use my lists and to-do sections for my ‘brain dump’. I used a mixture of the die cuts and stickers to make a list of things that make me smile. 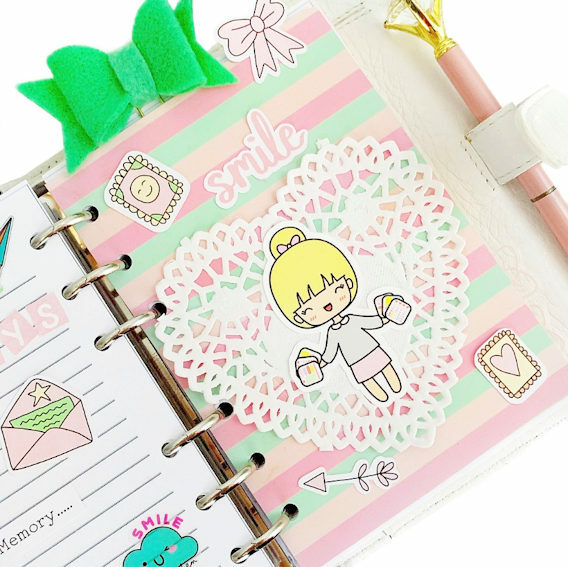 I hope this inspires you to create you own happy notes in your planner.